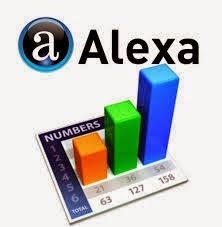 Alexa is used to get Ranking of your Blog all over the World as well as Ranking in your Country. In older Version of Alexa it was very easy to get Widget but now they have fully Changed thier Interface so some of the Bloggers will find it difficuilt to Install Widget to thier Blog. So today I will show you How to add Alexa Widget to your Blog with very Simple Method. The above Widget Just Show the Ranking of your Blog, If you want Ranking as well as Sites Links You can Copy the below Code and Paste it in your Blog.